Whether you're Republic, Democrat, Independent, or other, it's hard to argue against the effectiveness of President-Elect Barack Obama's game-changing online outreach. Armed with more than 10 million e-mail addresses, his legion of supporters were constantly kept up-to-date with the campaign, and were directly responsible for organizing, registering, and rallying millions more. Nearly 1/3 of the 10 million donated money to the campaign and shortly after winning the election, a message was sent to his supporters, that this was only the beginning. His campaign was able to keep him instantly connected with his supporters through the web, a lesson that business owners should also use to their advantage. 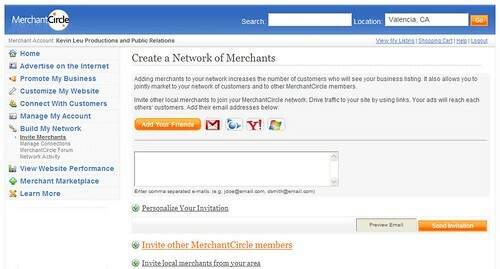 With MerchantCircle's e-mail options, you can upload your customer and contact information and business contacts to send out coupons, blogs, or newsletters. If you don't have any of your customer contact information, you should consider asking your customers whether they want to receive coupons and specials from you. As your contact list grows, you will be able to maximize the effectiveness of any specials or sales, without have to spend money advertising it in the newspaper, radio, or television. 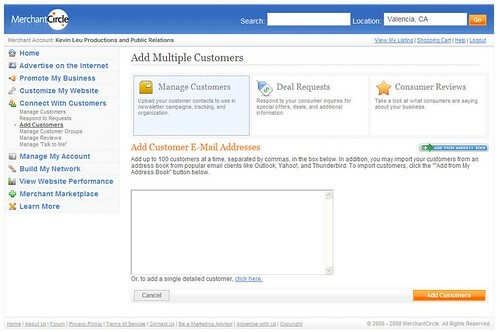 Just like President-Elect Obama's e-mail list, it won't cost you a thing to reach your most valuable customers. Click here to get started on your Merchant Dashboard. This is a good explanation of the power of managing a list properly and effectively. Congratulations to president Obama and his team. It's amazing how many businesses do not do this or so not do it properly. Where Do I Go and Vote?